Since the last Harry Potter book arrives at our house today, maybe I should make something British for breakfast… While I’m at it, check out these Harry Potter recipes. Update: I decided to make some scones from Nigella Lawson’s How to Be a Domestic Goddess for breakfast. They came out pretty well, although as I was making them, it hit me that they were really just the equivalent of baking powder biscuits made with homemade baking powder. And sure enough, that’s what they tasted like—must just be a translation thing! That still doesn’t explain why Nigella said they look like they have cellulite, though. 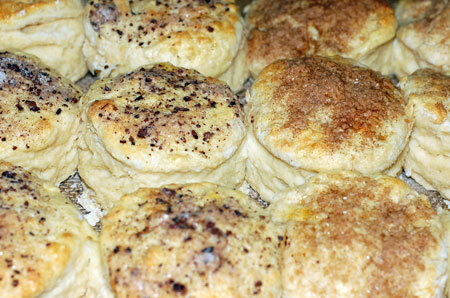 I topped half of my scones with cacao nib sugar and half with cinnamon sugar. 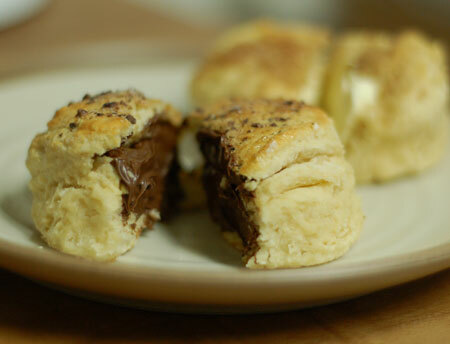 Since we didn’t have any clotted cream, we ate ours with butter, jam, honey, and Nutella. Sift the flour, salt, soda, and cream of tartar into a large bowl. Rub in the fats till the mixture goes like damp sand. Add the milk all at once, mix briefly—briefly being the operative word—and then turn out onto a floured surface and knead lightly to form a dough. Roll out to about 1 to 1 1/4 inch thickness. 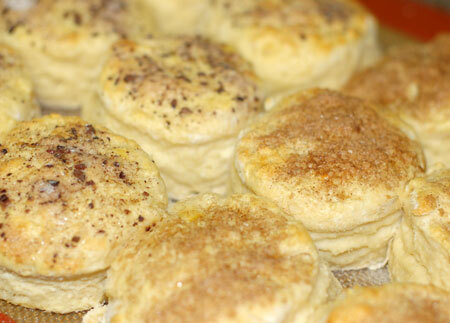 Dip a 2 1/3-inch crinkle-edged round cutter into some flour, then stamp out at least 10 scones. You get 12 in all from this, but may need to reroll for the last 2. Place on a greased baking sheet very close together—the idea is that they bulge and stick together on cooking—then brush the tops with the egg wash. Put in the oven and cook for 10 minutes or until risen and golden. Always eat freshly baked, preferably still warm from the oven, with clotted cream and jam, or “thunder and lightning,” which is clotted cream and molasses. Source: How to Be a Domestic Goddess , by Nigella Lawson. Squeeeeee!!!!! 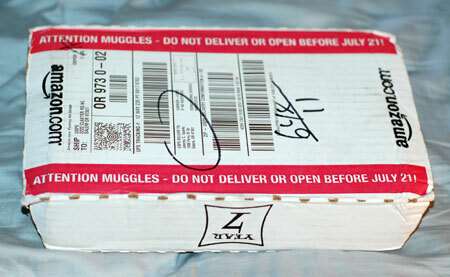 Oh how I’ll miss looking forward to HP books. Dave and I went to Hudson for the huge celebration. The whole town center turned into Diagon Alley and Hogsmeade for the day. Then we stood in line for the midnight release. First time, but enjoyable!! I put pictures of the town on my myspace page. Heather, I know how you feel. We aren’t big crowd people, which is why we opted for the home delivery. We have read all the HP books out loud together, so we just finished it on Sunday.